The True Value Modified Racing Series did beat the rain though, but it was close. This writer started having raindrops fall on his windshield about ten minutes after leaving Seekonk Speedway Saturday night. For a full report on the race, please click here. The TVMRS returns to action on Friday night at Lee USA Speedway for Make-a-Wish night. Speed51.com will be on hand to provide a full report. Speed51.com’s Bob Dillner is at a track somewhere just about every weekend. 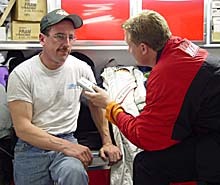 It’s usually as a result of his regular job as a NASCAR Nextel Cup television personality for Speed Channel. This weekend though, he’s able to do something a little bit different. 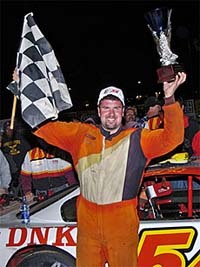 Dillner will take advantage of a rare break in his schedule to be back at his hometrack of Riverhead Raceway (NY) covering the NASCAR Whelen Modified Tour for Speed51.com. 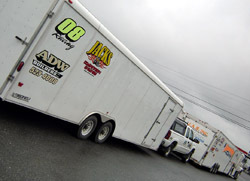 Nevertheless, I will be there for Speed51.com to cover the Mod Tour race. I only hope I can do as good of a job as ol' Twister does with all the shows." Friday night’s NASCAR Whelen Modified Tour race at Stafford Motor Speedway (CT) was postponed until July 3rd after heavy showers came over the track soon after time trials. Click here for news from the track. PASS got their feature in at Canaan Fair Speedway (NH) after a short rain delay in the afternoon on Saturday night, but Monday’s make-up race at Speedway 95 in Bangor, Maine was another story. Teams arrived in the morning to somewhat promising skies after a night of rain. However, the sun never peaked out and a constant mist and light rain took away any chance of racing. At this point, there is no scheduled make-up date for the PASS event at Speedway 95. Dillner might even get a chance to do a little racing himself. "I have an opportunity to race a Charger car there as well that night, but right now I have not decided if I am going to do that or not. My grandmother is in the hospital in New York and it all depends on how she is doing. If I am to race, I want to do it right and not just show up and hope for the best. An early favorite for the Unity 250 has got to be Johnny Clark. He won the DNK 250 last season and showed once again this past weekend that he knows how to get around the track. Bob Dillner (R) will get to see a lot of old friends, like Ted Christopher (L), again this weekend at Riverhead. There has been a late addition to the PASS schedule, but it’s a race at a track where the series competitors are more than familiar with. PASS will sanction the June 19th Unity 250 as part of their regular season slate of Pro Stock races. Last season, the event was known as the DNK 250 and was the biggest PASS event of the season. Because this race is being added to the 18-race schedule, PASS licensed competitors who enter the Unity 250 will be allowed to drop their worst finish of the 2005 season for the year-end points. The Unity 250 is one of several major Pro Stock events to be held this season in Maine that also include the Banknorth Oxford 250 and September’s Pullen Heavy Industries 300 at Beech Ridge. 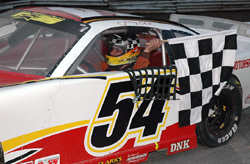 Clark and his team towed across Northern New England Saturday night to make it from Canaan to Unity and took part in the 105-lap Pro Stock feature on Sunday. The trip was well worth it as Clark won the race. Clark started on the outside pole and grabbed the lead on the first lap when polesitter Matt Lee took a wild ride into the turn four dirt embankment. At the halfway point, Randy Turner took over the lead from Clark but a power steering leak ended his time up front and Clark retook the lead on lap 81. Jeff Burgess finished second and Turner rebounded to finish third. The top five finishers were rounded out by PASS regulars Gary Smith and Scott Chubbuck. At the rate we are going, it seems like there might never be a totally clear weekend for racing again in New England. Unfortunately, this week wasn’t an exception.